Bobby Goss, Eddie Richard, Richard Bradley Steve DePaulo, Katrina Hill, Drenda Carroll, Nicole Hancock and the late Anthony “Chubby” Tiro” are among the best to ever compete in the Chelsea High track programs. Stephanie Simon has joined that illustrious group – and she’s only a junior. 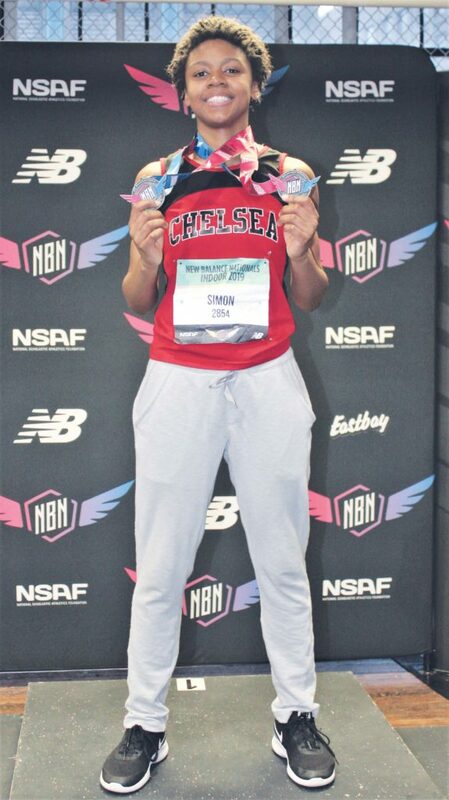 Simon completed her indoor track campaign with an unprecedented accomplishment: winning the long jump championship in the Emerging Elite Division at the 2019 New Balance Nationals that was held in New York City. Simon soared to victory with a career-best jump of 18 feet, 10.75 inches, remarkably eclipsing her previous best by seven inches. CHS track coach Cesar Hernandez was not surprised by Simon’s victory or the dramatic way in which she achieved it. Hernandez and CHS Director of Athletics Amanda Alpert watched the drama unfold at the Nationals. Alpert said Simon’s competitiveness and work ethic set the foundation to victory. Alpert expounded on the Chelsea coaches’ contributions to the Stephanie Simon success story. “We have an incredible coaching staff that has played a part in the team and Stephanie’s success,” said Alpert. “We are fortunate to have Cesar Hernandez, who is a Red Devil himself and competed on the collegiate level as jumper and has helped bring Stephanie to the next level. Simon and her teammates will begin their outdoor track schedule in April. There is no doubt that Stephanie Simon is on the radar of college colleges nationwide. Quintavius Smith, 22, 85 Blossom St., Chelsea, was arrested for failing to stop for police, speeding, stop sign violation, operating motor vehicle unlicensed, receiving stolen property over $250, reckless operation of motor vehicle. Domenic Strazzulla, 53, 151 Liverpool St., East Boston, was arrested on a warrant. Jomael DeJesus, 19, 93 Bellingham St., Chelsea, was arrested on warrants. Marbin Bardales, 34, 15 Haskel Ave., Revere, was arrested for possessing/drinking open alcoholic beverage in public. Spencer Clark, 38, 8 Grove St., Chelsea, was arrested for assault with dangerous weapon, threat to commit crime. Mario Hurtado, 24, 725 Broadway, Chelsea, was arrested on conspiracy to violate drug law. Carlos Hernandez, 21, 29 Library St., Chelsea, was arrested for operating motor vehicle with suspended/revoked license (2 counts). Elizabeth Toro, 30, 959 Broadway, Chelsea, was arrested for assault and battery aggravated on pregnant person. Amy Pinabella, 43, 59 Bellingham St., Chelsea, was arrested on warrants. Anastacio Rivera, 25, 116 Curwin Circle, Lynn, was arrested on 5 warrants. Brunildo Pabon, 40, 26 Eleanor St., Chelsea, was arrested for breaking and entering nighttime vehicle/boat for felony (2 counts), possessing burglarious instrument. Wilmer Reyes, 28, 948 Broadway, Chelsea, was arrested for operating of motor vehicle unlicensed, marked lanes violation, failure to wear seat belt. Daniel Barke, 25, 110 Malden St., Everett, was arrested on warrant. Dramane Ky, 25, 14 Central Ave., Chelsea, was arrested for disorderly conduct, assault and battery. Madeline Rosa, 39, 767 Broadway, Chelsea, was arrested for assault and battery on +60 disabled, unarmed robbery on +60, assault and battery with dangerous weapon on +60 person. Pedro Hernandez, 23, 767 Broadway, Chelsea, was arrested for assault and battery on +60/disabled, unarmed robbery on a +60, arrest warrant. Robert Soroka, 42, 235 Revere St., Revere, was arrested for receiving stolen property over $250. Dany Betanco, 38, 71 Congress Ave., Chelsea, was arrested for malicious destruction of property over $250, witness intimidation, larceny over $250. Kendrick Tate, 24, 27 Gerrish Ave., Chelsea, was arrested on a warrants, home invasion, kidnapping, witness intimidation, assault with dangerous weapon, possessing to distribute Class D drug, possessing Class B drug. Lucio Martinez, 19, 79 Marshall St., Somerville, was arrested for witness intimidation, kidnapping, possessing to distribute Class D drug, possessing Class B drug. 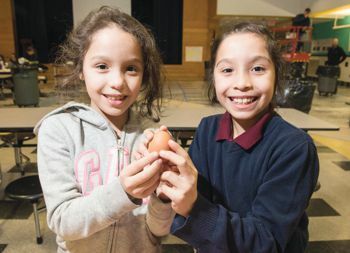 The team includes, Doris Hernandez, Maria Andurai, Sophia Vital, Jaylee Ortiz, Trinity Hoffman, Kylie Lemerise, Alyssa Soule, Julianna Vargas, Michelle Coreas, Melany Vargas Jayvianna Hunter, Raquel Class, Monica Cruz, coaches Henry Hoffman Colleen Soule. The Chelsea High football team turned in a valiant effort, but came up short by a score of 18-12 in a Thanksgiving Day battle with Matignon at Dilboy Stadium. The contest began well for the Red Devils. After the CHS defense forced Matignon to punt on its opening possession, the Red Devils marched 50 yards for a touchdown, capped by a four yard burst into the end zone by sophomore David Bui. However, Matignon bounced back thanks to a big return on the ensuing kickoff which brought the ball to the Chelsea 30. Matignon then executed a flanker reverse on second down to cover the 32 yard distance into the Chelsea end zone to knot matters at 6-6. The teams then exchanged punts, with Nick Ieng taking the Matignon kick and racing 64 yards for an apparent touchdown. However, Nick’s fine effort was called back because of a ref’s flag on a Chelsea player for a block in the back. With the Red Devils taking possession at their own 38, Chelsea proceeded to nullify the penalty by marching into the Matignon end zone. Senior captain Dennys Hernandez, an offensive lineman, got the call for the final two yards to make it 12-6 in favor of Chelsea. However, all of the good work of the Chelsea offense went for naught thanks once again to poor coverage on the ensuing kickoff. The Matignon kick returner took the ball all the way to the CHS three yard line, with kicker Henry Lemus making a saving tackle. Still, three plays later Matignon reached paydirt to even matters at 12-12. The half ended with Chelsea punting on its next offensive possession and Red Devil Luis Jiminez intercepting a Matignon “Hail Mary” pass as the clock wound down. The second half proved to be defensive struggle. The Red Devils were able to advance only as far as the Matignon 32 in the third quarter, with the drive sputtering out thanks to a mishandled snap on a third-and-five. Matignon then took over and put together its best drive of the day, aided once again primarily by a wide-receiver reverse play that eventually led to a touchdown from the Chelsea three yard line. With the contest now in the fourth quarter, the Red Devil defense needed to make a stop, and it did, giving the ball to Chelsea at the CHS 46 with about 4:00 to play. The Red Devils appeared primed to seize the momentum. Ieng carried for 22 yards off the right side, Bui ran for eight more yards, and a 12 yard completion over the middle from Mike Rowan to Dashuan Alves gave Chelsea a first-and-10 at the Matignon 16. However, that would prove to be as close as Chelsea would get to the Matignon end zone, as the drive ended after two incomplete passes. Matignon then was able to take knees to end the ballgame. “It was a tough one to lose,” said Halas. “Give lots of credit to Matignon. They had a game plan which they executed well. We did not make the key plays or enough plays to allow us to win the ballgame. They made more plays than we did, and they deserved to win the game. They outplayed us. A number of Red Devils turned in fine performances. Rowan hit on 13-of-18 passes for 71 yards. Jiminez was his chief target with six receptions for 41 yards. Alves grabbed two passes for 15 yards. Ieng lugged the ball 13 times for 74 yards and caught three passes for 12 yards. Bui rushed for 38 yards on seven attempts and had two receptions for three yards to go with his TD. Hernandez had one carry for two yards and a TD. Defensively, Hernandez was a bulwark with six tackles. Alves and Nelson Hernandez were credited with five tackles each. The duo of Edwin Dubon and Bui made four tackles apiece. Using the popular idiom – “the early bird gets the worm,’ the Boston Bruins left a day earlier for their Western road trip, with the hopes of creating a more fitting idiom, such as “the early team gets the win.” Departing a day earlier to arrive in Edmonton on Monday, Boston opened up their stay by one more day, which means that they arrived, relaxed, and had their Tuesday morning practice in Edmonton, instead of Wilmington. The Oilers roster will be missing two of their top players due to injuries, number one pick, Connor McDavid, and Nail Yakupov. While this matchup looks like an easy win for the Bruins, Edmonton, despite holding the bottom spot in league standings, has had spurts of playing well of late, and will likely not be easy pickings for the Bruins. The Bruins were looking to notch a victory over the Oilers and their general manager, former B’s GM, Peter Chiarelli, to start the three-game road trip, but their focus is on playing the steady, consistent hockey that has earned them their five-game win streak. On Friday, Boston will begin a back-to-back schedule with a game versus the Calgary Flames (12/4 at 9:00pm), and finishes up with the Bruins taking on the Vancouver Canucks (Saturday 12/5 at 10:00pm). This current stretch of five games in eight days will wrap up with Boston hosting the Nashville Predators (Monday 12/7 at 7:00pm), then back on the road to take on the Montreal Canadiens (Wednesday 12/9 at 7:30pm). The B’s left Boston with a five-game win streak which they hope to have extended to eight, at the expense of three Western Conference teams that are currently mired in the bottom six positions of their conference – all out of playoff position. A possible downside is the fact Boston has not faced any of the three teams they will meet on the three game road trip, which means it may take some time for the Bruins to adjust to the new faces and styles. Jude Cutone, 48, 207 Shurtleff St., Chelsea, was arrested on warrants. Marlon Rodriguez, 31, 94 Erving St., Everett, was arrested for improper turn, operating motor vehicle unlicensed, furnishing false name. Angel Quilan, 25, 45 Winter St., Quincy, was arrested on a warrant. Amilcar Hernandez-Rodriguez, 26, 31 Heard ST., Chelsea, was arrested for operating motor vehicle unlicensed, one way violation. Antonio Rivas, 23, 110 Orange St., Chelsea, was arrested for assault with a dangerous weapon. Alberto Lopez Junior, 21, 88 Williams ST., Chelsea, was arrested for possessing to distribute Class B drug, conspiracy to violate drug law, possessing to distribute Class D drug. Michael Fitzpatrick, 46, 767 Broadway, Chelsea, was arrested for assault and battery with a dangerous weapon, warrant, assault with serious bodily injury, assault to murder, carrying dangerous weapon. Jose Ramos, 28, 12 Fourth ST., Chelsea, was arrested for shoplifting. Marshfield, was arrested for operating motor vehicle unlicensed, red light violation. Carlos Torres, 39, 35 Jefferson Ave., Chelsea, was arrested for operating under the influence of liquor & serious injury, operating motor vehicle unlicensed, reckless operation of motor vehicle. Juan Lassend-Soto, 25, 32 Carmel St., Chelsea, was arrested or possessing Class A drug. Sully Rios, 23, 122 Beacon St., Chelsea, was arrested on a warrant. Jose Colon, 18, 199 Chestnut St., Chelsea, was arrested or assault with a dangerous weapon, threat to commit crime. Lisa Selvage, 50, 10 Forsyth St., Chelsea, was arrested on warrants and shoplifting. Rogenia Cobb, 42, 105 Chauncy St., Boston, was arrested for shoplifting. Thomas Dunn, 34, 56 Franklin Ave., Chelsea, was arrested for assault and battery on a police officer, assault and battery with a dangerous weapon, threat to commit crime. Elizabeth Spatcher, 28, 900 21st St., Other, FL, was arrest ed on a felony warrant. Michael Silva, 34, 22 Athens Dr., Saugus, was arrested for possessing Class A drug. Jose Gonzalez, 57, 121B Hawthorne St., Chelsea, was arrested for assault and battery an d with disturbing the peace. Anna Bailey, 29, 124 Spencer Ave., Chelsea, was arrested on a warrant. Jaspar Dodson, 28, 855 Broadway, Chelsea, was arrested for trafficking cocaine, conspiracy to violate drug law, possessing to distribute Class B drug. Sir Dodson, 27, 855 Broadway, Chelsea, was arrested for trafficking in cocaine, conspiracy to violate drug law, warrants, possessing to distribute Class B drug. Mary Sackor, 34, 25 Standaford St., Boston, was arrested for disorderly conduct and disturbing the peace. Alexus Iraola, 18, 78 Reed Ave., Everett, was arrested for larceny over $250, attempted breaking and entering night time for felony and dangerous weapon. Tanya Morris, 35, 15 Staples Ave., Everett, was arrested for shoplifting. Cesar Alicea, 19, 53 Broadway, Chelsea, was arrested on a felony warrant. Francisco Correa, 39, 28 Malden St., Everett, was arrested for possessing Class A drug. Zacarias Concepcion, 28, 307 E. 8th St., Boston, was arrested for distribution of Class A drug. Saulorenan Solisborjas, 20, 182 Hitchborn St., Revere, was arrested for disorderly conduct and threat to commit a crime. Norma B orjas, 41, 182 Hitchborn St., Revere, was arrested for disorderly conduct, assault, interfering with police officer and threat to commit a crime. Meneel Hernandez, 17, 103 Garland St., Everett, was arrested for receiving stolen motor vehicle, resisting arrest, assault and battery on a police officer (2 counts). William Ginepra, 39, 5 Admirals Way, Chelsea, was arrested for assault and battery, assault and battery with a dangerous weapon (2 counts). William Morales, 18, 147 Shurtleff St., Chelsea, was arrested for unarmed robbery, assault and battery, intimidate witness, resisting arrest. Luis Tizol, 22, 147 Shurtleff St., Chelsea, was arrested for un armed robbery, assault and battery (2 counts). Jarrod Harris, 38, 147 Russell ST., Everett, was arrested for assault with a dangerous weapon, threat to commit a crime, conspiracy, witness intimidation, warrant. Angel Andrades, 45, 5 Webster Ct., Chelsea, was arrested for possessing Class A drug. Jery Hernandez, 19, 112 Grove St., Chelsea, was arrested on warrants. Mary Caraballo, 23, 472 Riverside, Lawrence, was arrested on a warrant. Jeffrey Whitley, 52, 767 Broadway, Chelsea, was arrestrd for trespassing. Tomas Barillas, 18, 26 Grove St., Chelsea, was arrested on a warrant. Cesar Alicea, 19, 53 Broadway, Chelsea, was arrested on warrants. Emidio Diniz, 45, 38 Grove St., Chelsea, was arrested for operating motor vehicle with suspended/revoked license, uninsured motor vehicle, unregistered motor vehicle. Guy Waters, 36, 35 Dennis St., Boston, was arrested for possessing to distribute Class drugs, resisting arrest. Rosemarie Lewis, 51, 16 Shurtleff St., Revere, was arrested for operation of motor vehicle unlicensed, one way violation, leaving scene of property damage. Stacey Doe, 46, 150 Captains Row, Chelsea, was arrested on warrants. Jose Colon, 18, 199 Chestnut St., Chelsea, was arrested for assault and battery with a dangerous weapon. Jessica Palilunas, 26, 66 Englewood Ave., Everett, was arrested for aggravated assault and battery, assault and battery with a dangerous weapon. Nicole Castro, 28, 185 Fells Ave., Medford, was arrested on warrants. Norma Cruz, 33, 1 Webster Ct., Chelsea, was arrested for shoplifting. Robert Nicoli, 50, 738 W. Briar Pl., Chicago, IL, was arrested for possessing Class b drug, conspiracy to violate drug law. William Garcia, 29, 70 Franklin Ave., Chelsea, was arrested for distribution of drugs, possessing Class B drug, conspiracy to violate drug law. Kathy Hawes, 50, 7 Temple St., Cambridge, was arrested for shoplifting. Henry Acosta, 21, 59 Burma Rd., Chelsea, was arrested on a warrant. Kevin DiGaetano, 23, 973 Broadway, Chelsea, was arrested on felony warrant. Thomas Fitzpatrick, 49, 39 Winlock Rd., Boston, was arrested on felony warrants.